We’ll start with the obvious – reserve that table. Do it as far in advance as you can. If you are booking close to the date, then prepare to be flexible with the date and the time. Here’s a little bonus tip for you: always be prepared to be flexible with time. If you ask for a table at 8:30pm, and the restaurant suggests either 8:15pm or 9:00pm, it’s because they have fully booked your preferred slot. They want to ensure the best service possible, so it’s better for you to have a slightly different time. Don’t be upset about it – it’s the first sign of good service coming your way. You may want a specific location in the restaurant, a certain table layout, or have diners with special dietary requirements, or who have mobility issues, etc. Let the restaurant know when you make the booking. And if your pre-Christmas dinner party also happens to be one of your guest’s birthdays, too, tell the restaurant now! You reserved a table for six. It’s now eight. Don’t assume the restaurant will be able to fit you all in. We’ll try, as will most restaurants, but it may not be possible. As soon as you know your number of guests has changed, fewer as well as more, call the restaurant. This ensures you won’t be disappointed, and helps the restaurant, too. Your table will be laid exactly as it should be for your arrival. And, if a couple of your party drop out, telling the restaurant allows them to reconfigure the dining room so that another party doesn’t have to be disappointed. Arrive a few minutes ahead of your reserved time – five minutes is perfect. Don’t be late – but if it is unavoidable, let the restaurant know. And here is the big one: if you won’t be able to make it, let the restaurant know as soon as possible. Don’t simply not turn up. Turning up late or being a no-show can have a significant effect on a restaurant. 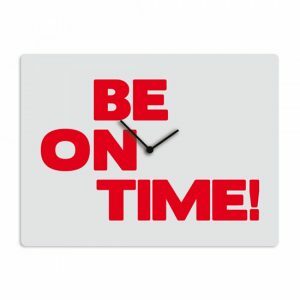 If you know your friends are always 20 minutes late, tell them you have booked a table for 20 minutes earlier! Enjoy a drink at the bar while you wait for your ‘late arrivals’ with your ‘on-time’ guests. 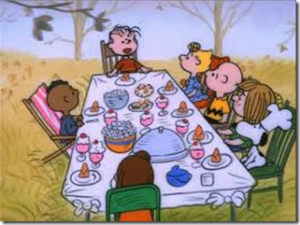 Make one of your group responsible for your table. A ringleader who acts as the contact for the waiter or waitress. It’s a great communication technique, and will help your table receive the very best in front of house service. When your waitress knows exactly who to look to for your at-the-table needs, your pre-Christmas celebration will run far more smoothly. #7: Don’t help the waitress by taking drinks off the tray! You may wonder how a slip of a waitress can carry so many drinks on a single tray. It’s all about the balance. They have been trained to load a tray properly. But loading the tray is only half the story. When passing your drinks to you, they do so in an order that retains the balance. Take one off out of turn, and you’re likely to get the remainder in your lap! Let the waitress do her job, especially when it comes to serving drinks from a tray. It’s always best to pay as a single bill, and then divvy the cost up over a drink at the end of the meal. But, if you do want separate bills, tell the waiter or waitress at the beginning of your meal. Let them know who will be paying together. The waiter will be able to track who must pay for what, and your bills will be prepared faster and more accurately. When we welcome you to Christopher’s, we want to give you the best service possible. We’ve won awards for our front of house. Help us to do so, and you won’t be disappointed. This December, we’re open at lunchtime and for evening dinner. Our Christmas Fayre menu is available every day through to Christmas Eve. Three courses, with a bottle of wine per couple. And for only €16.95 per person. Perfect for friends and families, and for businesses to thank their staff and customers this Christmas. 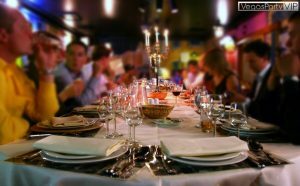 Call us on (+34) 600 01 28 24 to book your table and enjoy a cracking Christmas Fayre at one of Torrevieja’s top 10 restaurants (as rated by diners on www.tripadvisor.com).